Magnus Magnusson, the former presenter of BBC TV's Mastermind programme, has died at the age of 77. Mr Magnusson, who was born in Iceland but moved to Scotland at the age of one, had been diagnosed with pancreatic cancer in October. The broadcaster, journalist and writer died at his home near Glasgow. Mr Magnusson, who is survived by a wife and four children, was known for his catchphrase "I've started so I'll finish" on the long-running quiz show. His family said he died peacefully on Sunday evening in the presence of his wife Mamie and children Sally, Margaret, Anna and Jon. His elder son Siggy died in 1973. In a statement, his children said: "Magnus was the most generous, steadfast, loving and loved of husbands and fathers. He taught each of us how to live, and in the last few weeks he has taught us how to die. He did both with infinite grace." Mr Magnusson joined the BBC in 1964 as a presenter on the Tonight programme before going on to host Mastermind for 25 years from 1972. BBC director general Mark Thompson led tributes to one of the most familiar faces on British television. 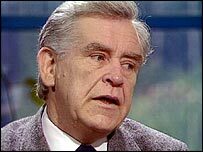 "For millions of viewers Magnus Magnusson was one of the defining faces and voices of the BBC," said Mr Thompson. "To the contestants of Mastermind, he was a tough but always fair questionmaster, but behind this screen persona there was a family man of tremendous warmth and humanity. "All our thoughts are with his family at this very sad time, and everyone at the BBC will share their tremendous sense of loss." Mastermind's current presenter, John Humphrys said: "You can't waltz into the programme as the new boy, like I was, and after a few years say 'oh it's my programme'. The fact is it will always be Magnus Magnusson's Mastermind." One of that show's most famous winners, Fred Housego, said Mr Magnusson's serious on-screen persona was deceptive. "He was a delight. He had a rich sense of humour. He loved what he did and we stayed friends for many years. What a joy," he said. In 2004 Mr Magnusson had to undergo emergency abdominal surgery after reportedly suffering a ruptured stomach abscess. He was awarded an honorary knighthood in 1989 and had served as chancellor of Glasgow Caledonian University since 2002.